UK researchers have found the 12 neurons in a fly brain responsible for creating negative memories. It’s not enough that we swat flies or lure them to get stuck on glued paper, now we are also writing false memories into their brains. A team of neuroscientists at the University of Oxford have discovered a way to trigger behavior in flies by selectively modifying neurons in their brain and stimulating them with a laser in order to simulate a learning experience. As published in the science journal Cell, flies were made to prefer one smell over another even though they had no real world experience associated with either smell. The experiment has important implications for the eventual development of a technology to create false human memories. We could one day “learn” by having experiences directly inputed into our brains. Our brains are massive systems of interlocking neurons. In the organization of connections between cells are encoded all the memories of our lifetime. The possibility exists that if we can control these connections, and/or the behavior of the neurons, we could alter our memories; erasing some and creating others. While the brains of flies and humans have vast differences in scale, the structures in one often have an analogous partner in the other. If neuroscientists are able to control the memories of flies, the techniques used could conceivably be adapted into mammals and even humans. Like the fly, we could be made to prefer one stimuli over another based on neuron manipulation, not real world experience. Gero Miesenbock, leader of the Oxford project, and his team were looking for the cells in the fly brain that are linked to negative associative learning. This learning is how flies (and other animals) link an experience with an undesired outcome. For example, if “bad memories” of being swatted by a human hand are associated with the smell of perfume, the fly may start to avoid perfume. The associative learning neurons produce dopamine as a means of communicating with neighboring cells. Miesenbock modified the neurons of flies by adding a receptor for the chemical ATP (adenosine triphosphate). If ATP showed up around a neuron, it would be stimulated and release dopamine (triggering a “memory”). So what did the UK team want the flies to associate as a bad memory? Smells. Miesenbock and his team already have extensive experience with fly antennae neurons (they published a paper on it) and could test flies readily for smell preference. They exposed flies to two smells, one with the “bad memory laser”, one without. The flies were then allowed to crawl in a small chamber until they came across the two odors, one on each side. Most flies wouldn’t prefer one smell over the other. 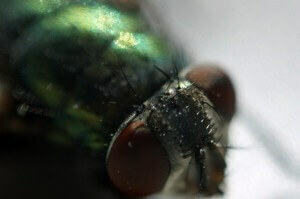 But those flies who had the correct neurons stimulated by the laser would have a “bad memory” associated with it. As expected, some flies tended to avoid the “bad memory” smell and move towards the other, even though there was no real-world experience associated with the “bad” smell. The flies had artificially gained a “bad memory” and were acting as if it were real. By tracking which flies behaved accordingly, Miesenbock and his team identified the 12 neurons in a fly brain that are responsible for associative learning. Stimulate those 12 cells, and a fly will likely avoid whatever it is experiencing at the moment. This stuff is scary and amazingly cool. Just 12 neurons shape the behavior of the entire insect. Imagine the possibilities with humans. By manipulating just a tiny portion of the brain, we could make anything have a negative memory associated with it. The alarmist in me warns that this type of technology could be abused to control people. It could also be used to quit smoking, or eliminate other bad habits. Eventually, this sort of research will hopefully lead to the next step in understanding memories, implanting skills through direct neuron stimulation. Perhaps one day we could have all the experience of a PhD without spending a day in school. For now this is still science fiction, but thanks to flies it has taken one step closer to reality.